We love scotch. : what a beautiful day for a kevin cyr interview! what a beautiful day for a kevin cyr interview! after weeks of inconsistent weather, vacillating rapidly between hot and miserable, a long, mean train of unseasonably cold weather punctuated with glimmers of sunny false hope, we here in eugene have been blessed with the kind of day perhaps only Vermeer could do justice to. this morning i awoke to the kind of day so beautiful that even with all the curtains drawn the sun seems to find its way in and tap you on the shoulder early in the morning to rouse you for the day. it was the kind of morning that smells of adventure, and my sense of motivation was piqued by the prospects. chloe gallagher: so how did the inspiration for your camper bike series develop? and, since I know you've been traveling a lot lately, can you tell us geographically where this epiphany hit? cg: i know that automobiles have been a theme for you for quite some time, particularly the slightly decrepit and nondescript. did you have an interest in alternative modes of transportation before you began your travels? kc: i've always been interested in bikes, motorcycles and painting cars was my way of documenting the changes in the U.S. through our car culture. traveling abroad has exposed me to vehicles that I never knew existed and has also provided insight into different cultures. I think you can tell a lot about a place by the types of vehicles people drive - like the rickshaw in India and the 3-wheel bikes in China. cg: was you interest in the various bike-camper amalgams that you saw an environmental interest of a social one? What was it about them that captured you? kc: until i built a camper last month in Beijing, it didn't exist. i guess it's a little different from my other paintings, because i'm no longer documenting a particular kind of vehicle, but creating my own. it became a social interest when i realized the cultural differences in regards to recreation. i grew up camping, but the idea of sleeping in the woods is completely abstract to most. few people i met in Beijing had ever heard of an RV/ camper much less seen one in person. until now, i've thought of my project only in the context of China, about placing such an American object on something very specific to China. 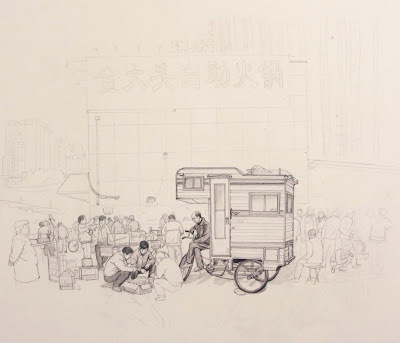 it's interesting to be how Chinese people react to the camper, until now they've only been exposed to luxury products, or brands from the U.S. i'd like to think that i'm doing something a little different with the camper. i've shied away from making it an environmental issue, flying to China and back is the worst thing i can do to the environment, so i'm not the one to say anything, but as our economy worsens and gas prices sky rocket my project does become more relevant in the U.S.
cg: in some of your earlier works you depict cars and vans grilled with graffiti. your hand style is spot on. if you don't mind me asking, has graffiti ever been a part of you life, or are you just a pitch perfect mimic? kc: coming from a small town in northern maine i was always too chicken to do graffiti. it's such a part of my environment in NY that it's naturally found it's way into my work (almost every van in my neighborhood has some graffiti on it). 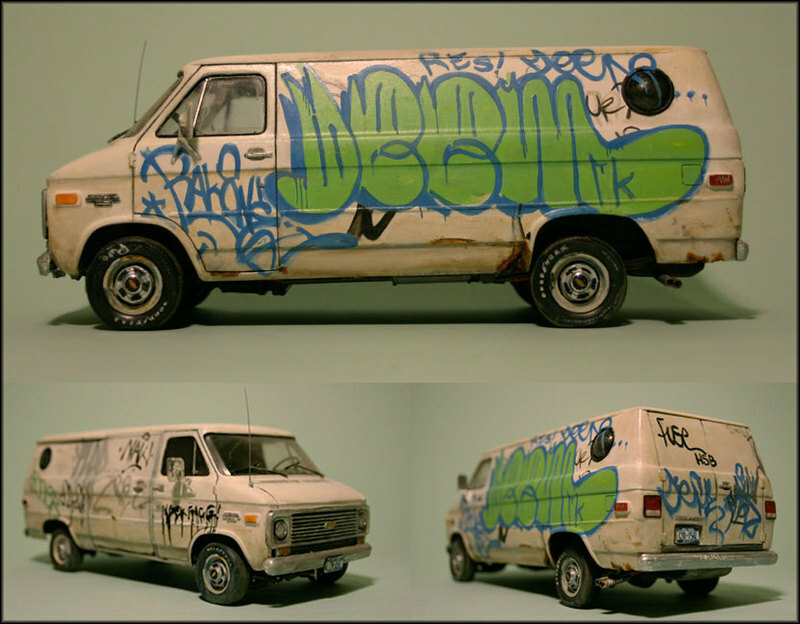 i like how it adds character to an already decrepit van, and it's fun to paint. cg: your chevy van sculpture is just amazing. did you draw inspiration from earlier installation art, like ed keinholtz and his backseat dodge '38, or is that just the art history nerd in me talking? kc: i just had to look him up, but i'll definitely draw inspiration from him next time i consider working in 3-D. Thanks. i was really interested to see if my painting style could translate into three-dimension. i like how it came out and i plan on making more someday. cg: do you ride a bike? kc: i do ride my bike, everyday. my commute now is very short, but i was a bike messenger in Boston for five years. it was a fun time and i made lots of really close friends. 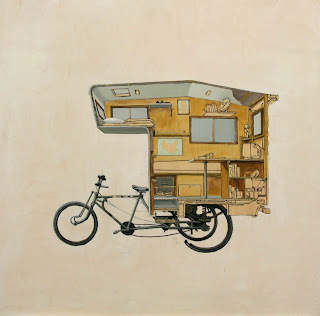 my interest in biking is partly what led me to the camper bike project. cg: you render your machines so lovingly, but on your site i also saw some lovely portraits of people. how do you approach the painting of a person differently than you approach a Hostess Cupcake truckette? kc: it's fairly similar, but i spend much more time getting the drawing just right and i use an underpainting with a portrait. painting a truck is a little more forgiving, if some aspect of it is inaccurate it doesn't matter as much. cg: do you have a favored medium? 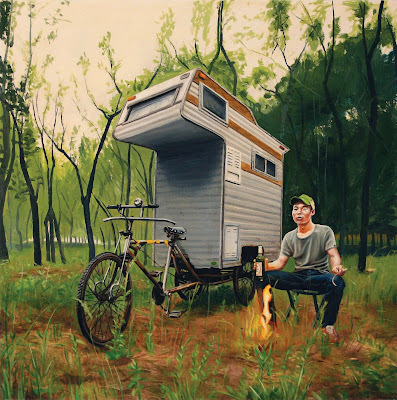 kc: oil paint on wood, but it was really fun to make the camper-bike. cg: what kind of art supplies do you take with you when you leave home? kc: usually just the basics, sketchbook and pencils, then i buy paints and other supplies as i need it. my camera is crucial, because i do as much documenting as can. i always regret when i don't have it ready. cg: if i threw a fabulous kevin cyr party, and you were going to make a grand entrance, what song would be playing when you walked into the room? kc: "making time" by Creation, but sung by my friend eddie wang at karaoke (KTV in Beijing). it has such a great intro and i think it would be funny to hear my friend eddie sing it. he love KTV but his english is a little limited. that song is on the Rushmore soundtrack, which is still one of my favorite movies. What a incredible site! As a lover of fixed speed bikes I find your artwork insiring. 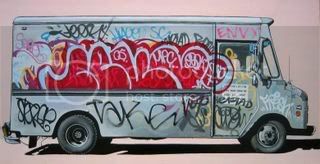 It makes me want to go out and find a graffi artist to customize my '93 Toyota dually cube truck. 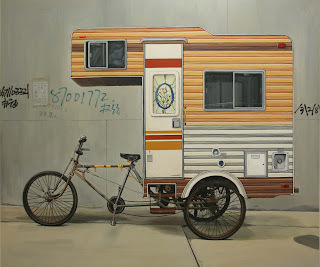 what is ur frame in the camper made of.is it hard to pedal and does it have a grill? oh! wonderful! Thank you for share. Pick your beauty now,It is suitable for both men and women.Come on,your beauty is in our website waits for you. i work at a contemporary art gallery in eugene, or. i think of every day in the art field as a brick in the monument i'm building to the arts. Sarah Ciampa's "Omens and Accidents"